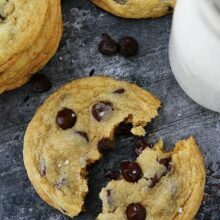 Skillet Chocolate Chip Cookie-a giant soft and gooey chocolate chip cookie that gets baked in a skillet! This easy dessert is a family favorite, especially when served warm with ice cream! Today is a special day! It is Maxwell’s first birthday! I can’t believe our baby is ONE! I know birthdays are supposed to be happy days, but I am a little sad. My baby is growing up too quickly! To keep the tears from flowing, I am going to focus on the birthday celebration and that includes a Skillet Chocolate Chip Cookie. 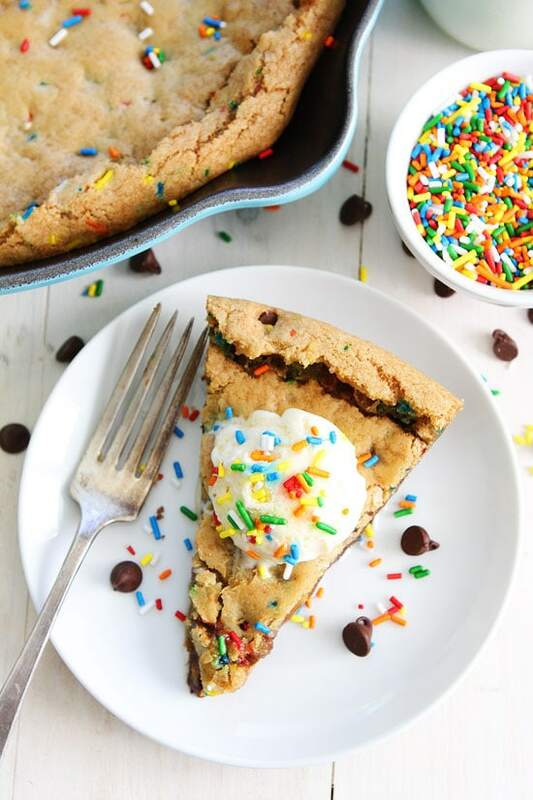 We aren’t big on birthday cakes at our house, we prefer to party with cookies, and one of our favorite desserts is this Skillet Chocolate Chip Cookie. You can’t go wrong with a giant cookie, especially when you serve it warm with a big scoop of ice cream! This is probably one of the easiest desserts I make and it is always a hit! You don’t have to scoop out individual cookies, you just press all of the dough into a skillet. Easy peasy! I slightly under bake the cookie so it is soft and gooey. I highly recommend you serve the cookie warm with ice cream too! The ice cream will melt into the warm cookie and you will most likely faint because you won’t be able to stand the dessert goodness! So what did the birthday boy think of his special treat? He LOVED it! 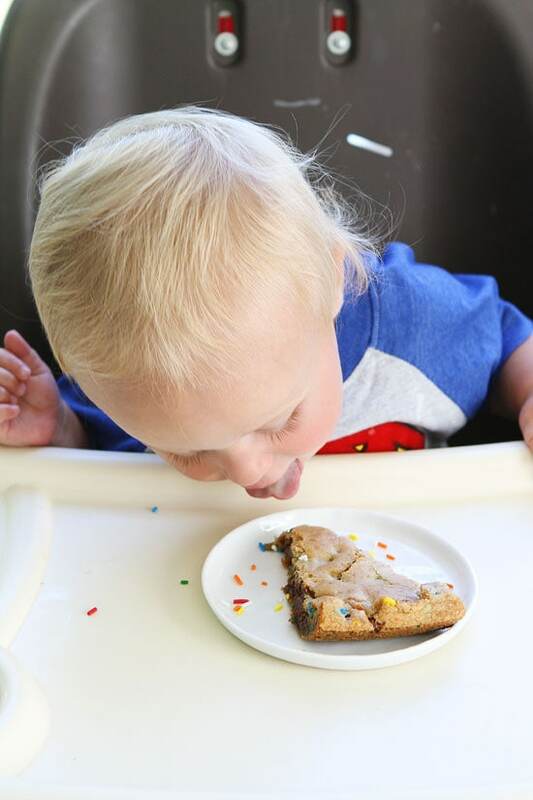 He didn’t wait for a fork, he dove right in, face first:) Smart kid! Happy Birthday Maxwell! We love you! 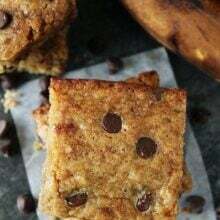 This giant soft and gooey chocolate chip cookie is easy to make and always a favorite! Serve warm with vanilla ice cream! In a large bowl, combine melted butter, brown sugar, and granulated sugar. Stir until smooth. Add the egg, egg yolk, and vanilla and mix until combined. Add the flour, cornstarch, baking soda, and salt. Stir until flour disappears. Stir in the chocolate chips and sprinkles, if using. Spread batter evenly in prepared cast iron skillet. Sprinkle the top with a little sea salt, if desired. Bake for 20-22 minutes or until golden brown. Don't over bake, you want the cookie to be slightly gooey. Remove from oven and let cool on a wire cooling rack for 10-15 minutes. Serve with ice cream, if desired. Note-you can use a 10-inch skillet or pie plate. The cookie will be a thicker so you will have to bake it a little longer. Happy Birthday Maxwell! Cute photo. We aren’t big on cake either, it never seems to be worth the calories. But a cookie in a skillet with a side of ice cream? You cannot go wrong there. And for my girlies, I can even spin this one into a Frozen theme cookie. I love a skillet getting used this way! Happy Birthday, Maxwell!! Such a cutie pie!! I’ve enjoyed watching him grow in the past year, through your blog. 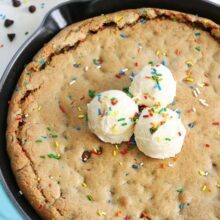 Hope to try this skillet cookie soon- it looks amazing! Now that’s what I call a chocolate chip cookie! Yum! Happy Birthday to Maxwell! Today is my parents wedding anniversary too so there is much to celebrate! Now, let’s dive into this cookie! Aww happy birthday, Maxwell!! Looks like he definitely enjoyed it. His eyes are stunning! Oh, my gosh, happy birthday to your baby! Such a cutie! Love that you made him a skillet cookie. Perfect birthday cake! Happy Birthday Maxwell!!! We love you!!! Happy birthday to Maxwell!!! 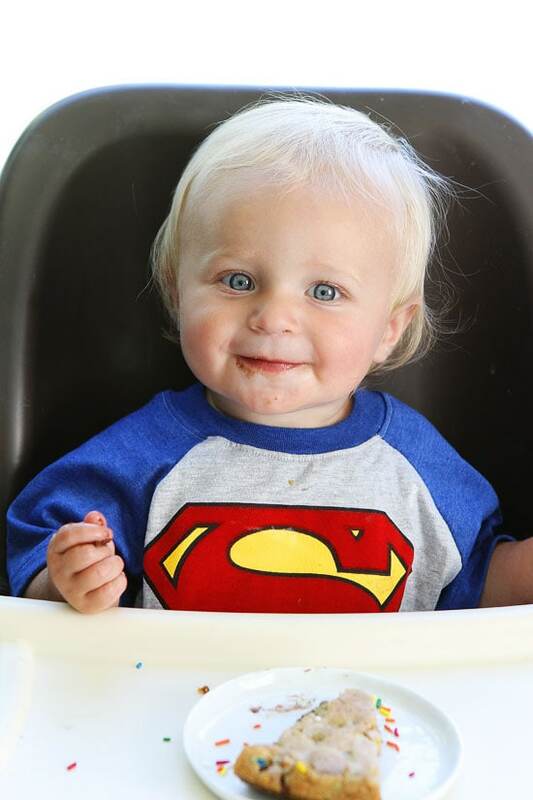 What a delicious treat to celebrate his first birthday with! What a cutie! Happy birthday, Maxwell! 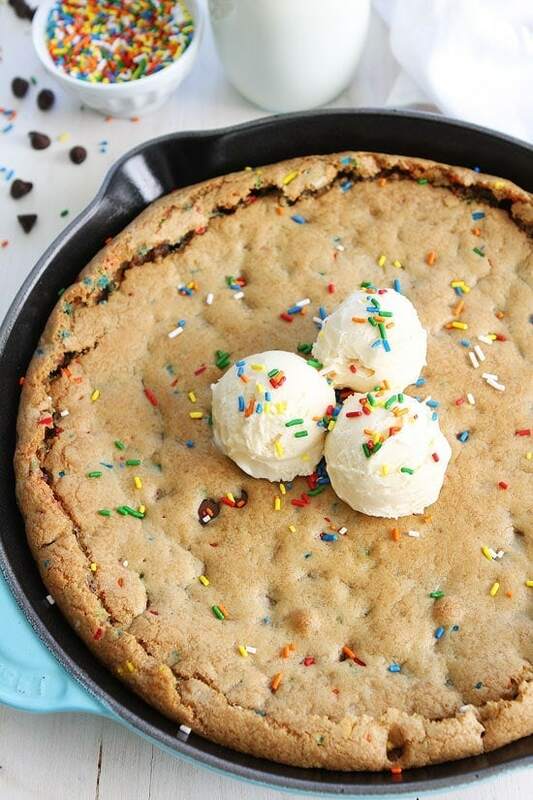 This skillet cookie looks amazing. I’ve never made one before, but you’ve inspired me! Can’t wait to try it. Omgee i have everything to make this right now except for the cornstarch. Is it necessary? And Happy Birthday to Maxwell!!! 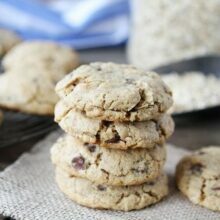 The cornstarch makes the cookie softer, but if you don’t have it, it will still be good! Enjoy! Awwww, happy birthday to him! 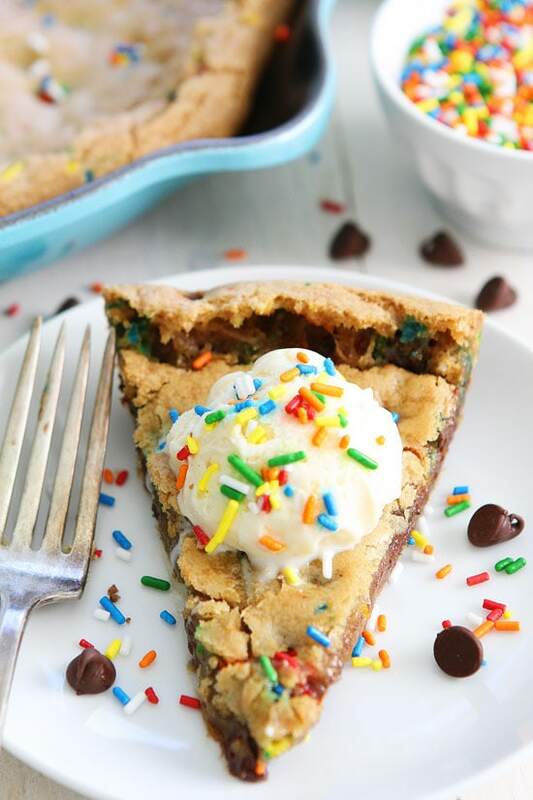 Beautiful skillet Cookie! Hope your cutie Maxwell had a great day!! This would be gone in one sitting at my house!! I CANNOT believe Max is One! Seems like just yesterday I was reading you were pregnant! Happy Birthday! Hope he enjoyed this yummy cookie cake!! A perfect recipe for my 11 year old to prepare! Thanks & HBD to your son! Um yes please! This looks absolutely delicous! I’m usually not a cookie person but when it comes in huge slices like this one I’m game! I would love for you to come link up at Throw Back Thursday tonight! Thank you for this wonderful cookie cake recipe! I made it yesterday for a party and it was a hit!! Delicious!! Thank you! Can you make another kind of cookie the same way? I have a weird kid who doesn’t like chocolate chip cookies. Maybe Oatmeal? Have you ever used pre-made cookie dough? would you use the small tube or the larger family size? We have a 10 inch skillet – any recommendations for substituting? Bake longer? Reduce the ingredients? Thanks! 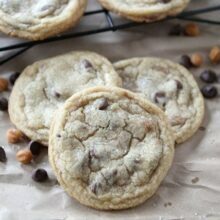 You can use it, the cookie will be a little thicker, it might take a little more time, check it at the same time and if it is still really gooey add a few extra minutes. I’ve been making this for years and your recipe is absolute perfection. Just wanted to say thank you for the amazing recipe!